I have redesigned everything to use block names and states instead of numeric block identifiers (as Minecraft 1.13 does). 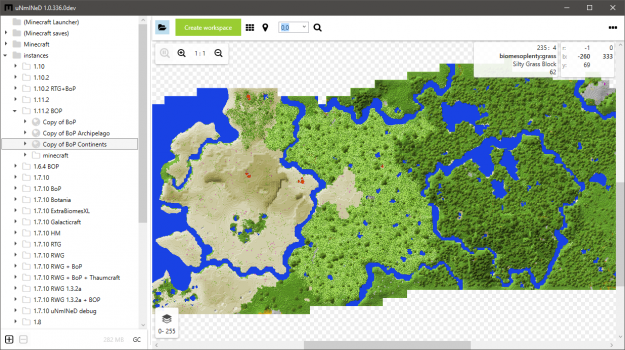 First sample images and a basic command line mapper for Minecraft 1.13+ will arrive within a few days. Thank you all for your comments, donations, support and patience! 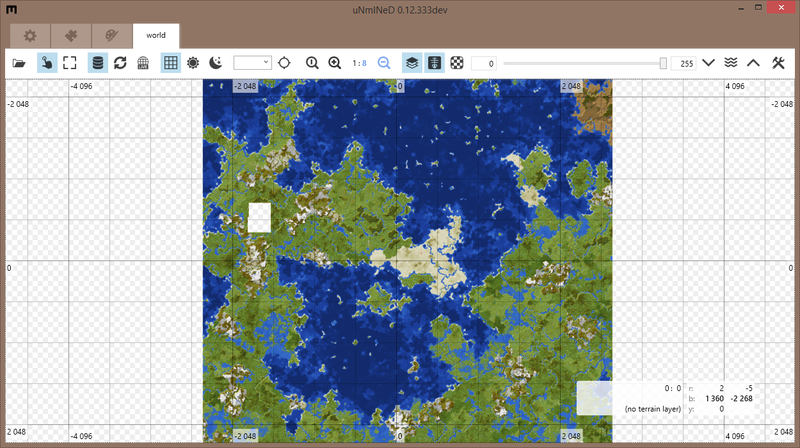 *: uNmINeD has it’s own chunk format called tile, optimized for fast overview mapping and low memory usage (one tile is 256×256 blocks wide). **: Slice is a horizontal section of a tile, like you had cut the world at a certain height. Slices contain only the top layer of blocks that are visible from above. Slices and tiles are cached, so uNmINeD doesn’t have to reload and process chunks from game files every time you change rendering options. This entry was posted in Uncategorized on Thursday, January 10 (2019) by megasys. I’m going to release the first development version for Minecraft 1.13 next week, then regular updates will follow, one or more each week. This entry was posted in Uncategorized on Wednesday, January 2 (2019) by megasys. First beta releases are coming in a few weeks, probably in December. The new version is based on .NET Core 2.1, so the minimum supported OS is Windows 7 SP1. The desktop GUI is Windows-only, but the command line version should run on recent Linux distributions and on MacOS 10.12+. It’s also possible to create a web GUI for all these platforms. Windows XP may be supported later if the code compiles for .NET 4.0 without major issues. This entry was posted in Uncategorized on Tuesday, November 27 (2018) by megasys. I can spend more time on uNmINeD in September and the coming months. Many things have been already done. 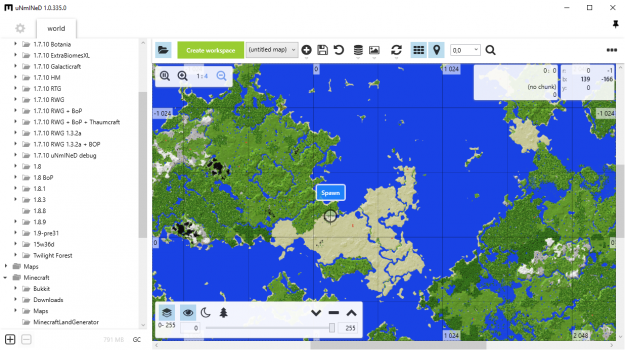 First I will release a command line tool that can be used to generate single images and map tiles for Google Maps and other web based viewers. Then comes the GUI version and some documentation. This entry was posted in Uncategorized on Monday, September 10 (2018) by megasys. This entry was posted in Uncategorized on Monday, August 6 (2018) by megasys. The default stylesheet for Minecraft and BiomesOPlenty blocks are being ported to the new engine. Beta releases and feature lists are coming soon. This entry was posted in Uncategorized on Thursday, March 30 (2017) by megasys. Sorry for the long time without a release. I haven’t had so much time for coding uNmINeD the last few months, but I have finished many features like zoom-out, caching, Forge integration (with MetaDump), and a more configurable renderer. I’m in a middle of doing some refactoring now, and porting the project to Visual Studio 2015, after that I will make a release. This entry was posted in Uncategorized on Tuesday, August 18 (2015) by megasys.